Last year with Payton absent due to the Bountygate scandal, the Saints had the worse defense record of the season, allowing an NFL season record of 7,042 yards. But with Payton back this year and under the direction of new coordinator Rob Ryan, the Saints defense made a stand at its own 3-yard line in the final seconds resulting in an end zone interception by safety Roman Harper that resulted in a 23-17 win over the Falcons. 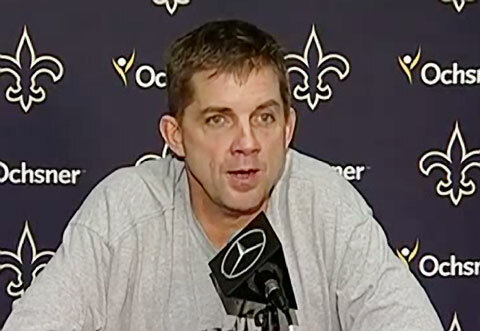 Payton, who was named AP NFL Coach of the Year in 2006 and who led New Orleans to a Super Bowl title in 2009, is the first head coach in modern NFL history to be suspended for any reason. On January 22, 2013, NFL Commissioner Roger Goodell reinstated Payton and in 2013, Payton agreed to a new multi-year contract extension as head coach of the Saints. If you would like to book football speakers or NFL coaches like Sean Payton for a speaking engagement, autograph signing, guest appearance, product endorsement, Super Bowl party, celebrity golf tournament, charity fundraiser, VIP meet & greet or special event, you can request Sean Payton speaker & booking agent agent info or call 800.966.1380.